University is a range of white synthetic general-purpose artists' brushes with distinctive red handles and white tips. 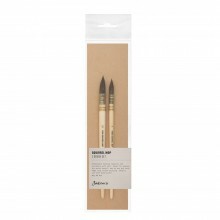 Manufactured to our high standards, these brushes are stiff enough to use with slightly more fluid oils and acrylics yet soft enough to use with water colours making University a genuine all-purpose range. 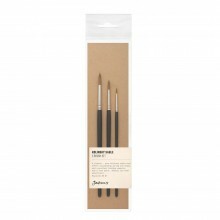 The polyester filaments in University brushes give smoother brush marks compared to hog hair making them excellent for fluid oils and acrylics with less visible brush strokes. The polyester also offers excellent spring and head shape retention and will last a considerable length of time if properly cared for. The handles are finished in five coats of lacquer to protect the natural wood from swelling in use and to prevent any solvents from penetrating the wood. The affordability of University makes it suitable for all artists from beginners to professionals wanting an excellent inexpensive all-purpose brush. It's also a great range for crafters. When cleaning synthetic brushes that have been used with oil paint it is advisable to not use turpentine as it will start to break down the synthetic filaments within the brush. Instead we recommend to use an odourless / low-odour brush cleaner. The brush head is the same as series 234, the longer handle is generally more suitable for oil and acrylic painters. For fine detail lines & washes. The brush head is the same as series 233, but with a long handle which is more suitable for oil and acrylic painters. A short flat head. Creates sharp edges with control. Produces defined marks. Gives control of thicker or larger amounts of colour. Good for craft applications as the short hair controls the colour easily and the short handle gives good control. The classic round brush. The smaller sizes are indispensable for details and highlights especially with water colour, whilst the larger sizes give clean linear marks. For blending, softening edges & creating textures. A finishing brush mostly used for portraiture and landscapes. Creates soft details like skin and skies when blending. Also useful for stippling and graining effects in landscapes and painting cloth. A set containing 4 popular short handled brushes: 3 Round 233 brushes (Sizes 00, 2, 6) and one Bright 234 in Size 6. These brushes have just the right amount of stiffness for creating dry brush effects.